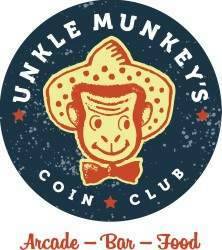 I had lunch today at a new restaurant/arcade in Edwardsville, IL (across the river from St. Louis) called "Unkle Munkey's Coin Club". They had a decent assortment of pinball machines, video games, Skee Ball, and a few other coin op classics as well as some good beer and food too. They just opened for business last week. All St. Louis area pinheads should try to stop in and check this place out. It has a nice bar with multiple TVs tuned to the Cardinals and some cute waitresses too. They also buy pinball machines and offer a repair service. It looks like it is designed to attract young and old alike. You had me until the Cardinals part, ha. You people have some weird obsessions down 'dare. I will have to stop by on my next visit, although I am usually there and back in the same day, which doesn't leave a whole lot of extra time. Someone should submit this location to the St. Louis Pinball Map, if it hasn't been done already. Thanks for the recon mission. I've been waiting for this place to open up. Actually it was my Dad who told me about the place. He lives in Edwardsville. We went to lunch today and he said he wanted to go to a new restaurant. I took the bait and he didn't say anything about it until we arrived there. He was laughing when we walked inside. He had read an article on it opening in the Edwardsville newspaper. I didn't even know about it. I'd say there were about 15 or so pinball machines and about the same number of classic video games. They are all set-up to take quarters. We each received 4 free quarters to play just for coming in the place. I had a couple craft drafts and the "Hot Mess" sandwich (which was awesome). Roast beef, pastrami, provolone & Swiss cheese, ranch, Srirsacha, and Giardiniera on a nice roll with home made chips. Pretty-cool place. I was talking to one of the guys there and he took me into the back room where they had two Stern Batman The Dark Knight Pinball Machines they were working on as well as several others. I have yet to meet the owner but I plan to visit again soon.